1. Cook first 4 ingredients in a heavy 2-quart saucepan over low heat until sugar dissolves and a candy thermometer registers 248° (about 15 minutes). Remove syrup mixture from heat. 2. 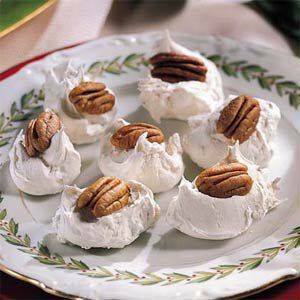 Beat egg whites at high speed with an electric mixer until stiff peaks form. Pour half of hot syrup in a thin stream over egg whites, beating constantly at high speed, about 5 minutes. 3. Cook remaining half of syrup over medium heat, stirring occasionally, until a candy thermometer registers 272° (about 4 to 5 minutes). Slowly pour hot syrup and vanilla extract over egg white mixture, beating constantly at high speed until mixture holds its shape (about 6 to 8 minutes). Stir in 1 cup chopped pecans. 4. Drop mixture quickly by rounded teaspoonfuls onto lightly greased wax paper. Garnish, if desired. Cool.